Bonfire night is a great time of year, the toffee apples and the hot dogs…yummy!! But it can also causes considerable distress to your pet birds. Parrots, budgies, canaries etc can get very scared of the loud noises and flashes that come with fireworks, just like dogs and cats do. To protect your pets on bonfire night, forward planning is key. Ensure you know what local displays are taking place, and maybe speak to your neighbours to see if they are planning to use any fireworks. 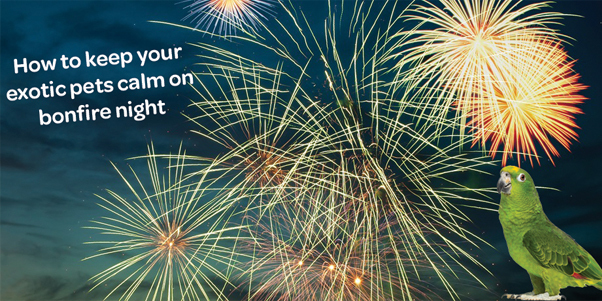 Don’t forget fireworks are used throughout the bonfire night season these days and not just on the 5th November. 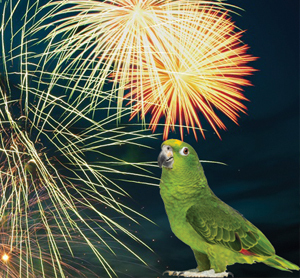 We’ve put together a few little pointers on how to make fireworks less stressful for your pet birds. Keep your pet bird indoors, with the windows and curtains closed. This will help to deafen the sound of those loud bangs and shield them from any flashes of light. Try playing your parrot’s favourite music or turn the television on to help drown out the noise from the fireworks. Parrots love music (and a little boogie) and the familiarity of the sound will help soothe them.